Veröffentlicht am Mai 8, 2012 | Kommentare deaktiviert für Download „Headwind“ for free! If you haven’t got our record „Headwind“ already you can now download it for free! „Name your price“ at our Bandcamp page and type in „0“ or more if you want. The album is also available on cd and clear orange vinyl. You can purchase it either by contacting us directly at soey_official@yahoo.de or our bigcartel page. 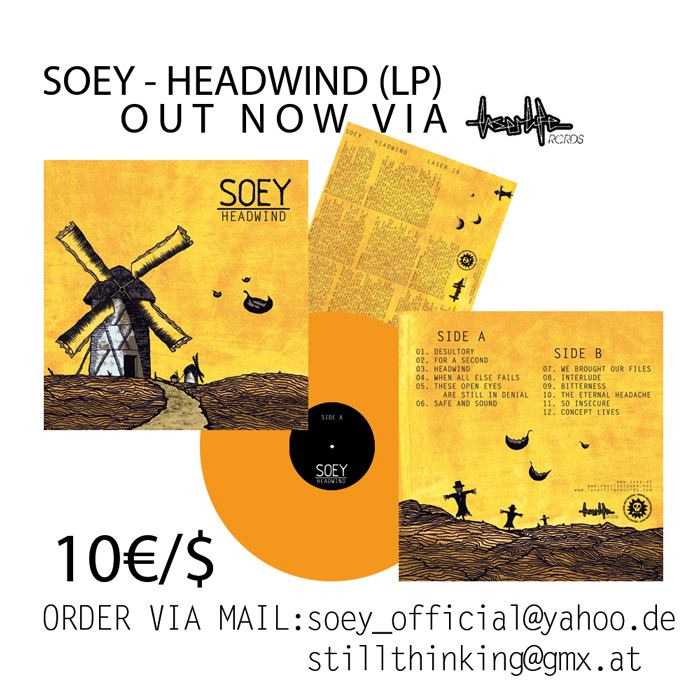 Kommentare deaktiviert für Download „Headwind“ for free! we’ll be out on the road with our buddys in THE LIBERATION SERVICE next week. Veröffentlicht am März 2, 2012 | Kommentare deaktiviert für BURGLARY! Someone broke into our rehearsal room and stole loads of gear (mostly guitars and amplifiers) on the night between Wednesday the 22nd and Thursday the 23rd of February. 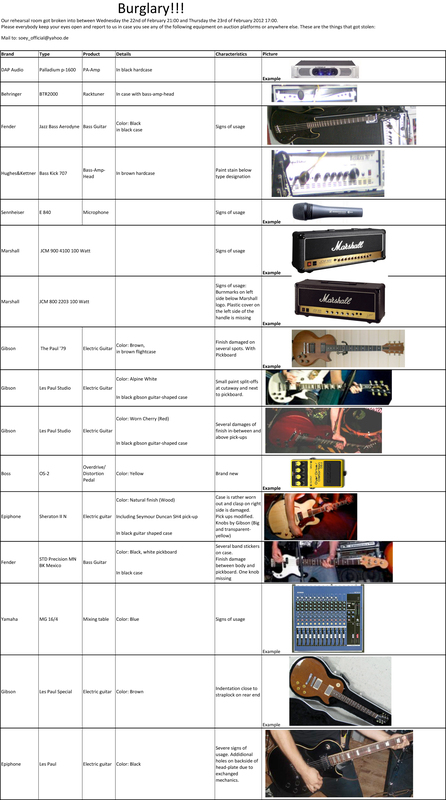 Here’s a list of all the missing things, please everybody keep your eyes open and report to us in case you see any familiar gear for sale. 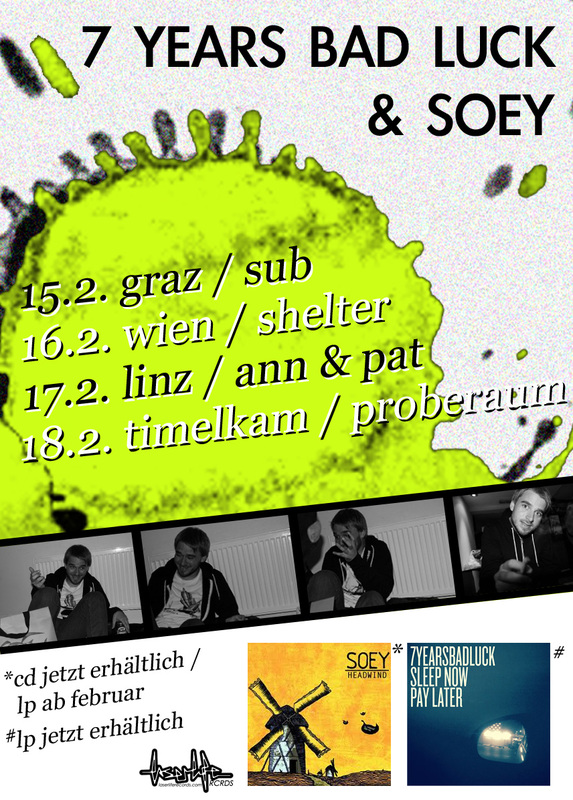 Austrian Tour With 7YBL, Headwind Out Now On Vinyl! Veröffentlicht am Februar 6, 2012 | Kommentare deaktiviert für Austrian Tour With 7YBL, Headwind Out Now On Vinyl! We’re looking back on an amazing weekend full of good food and two shows with Dead To Me. These guys are great and their new album is on heavy rotation in our headquarters at the moment, as you can guess. Really worth checking out. Thanks to all of you coming out early and watching us play. And massive thanks are due to Cis who was kind enough to lend us his van and join us on these two shows and Maily who took care of the sound and brought on the Jazz. We’re amazed at the amount of nice people that have joined us on any of our journeys so far, taking days off from work or studies in order to spent their time either freezing or sweating their brains out together with us in a van. Here’s to all of them! Furthermore we’re happy to announce the next shows with our friends in 7yearsbadluck! Come out and party with us! AND you are now able to purchase our latest album on beautiful transparent orange vinyl. Check out the Laserlife Records store or simply drop by at one of our shows. Kommentare deaktiviert für Austrian Tour With 7YBL, Headwind Out Now On Vinyl! Veröffentlicht am August 23, 2011 | Kommentare deaktiviert für Album Stream Up Now! Some of you might be sad to hear, but we are absolutely not: It’s the end of August! That means our Euro Tour in September is about to start and our new record is about to be released! In order to get ourselves and all of you in mood for these upcoming events we’ve put up a stream of the entire album on our Bandcamp-Page. Hope you enjoy it! Kommentare deaktiviert für Album Stream Up Now!